Detroit, Michigan - Thousands of union and community members participated in a March for Jobs, Justice, and Peace sponsored by the United Auto Workers union and Rev. Jesse Jackson's Rainbow PUSH Coalition. Several marchers carried letters urging people to vote in the November election. Image Description: Detroit, Michigan - Thousands of union and community members participated in a March for Jobs, Justice, and Peace sponsored by the United Auto Workers union and Rev. Jesse Jackson's Rainbow PUSH Coalition. 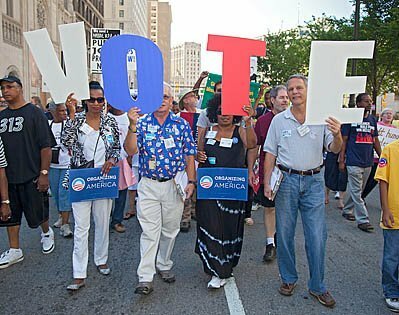 Several marchers carried letters urging people to vote in the November election.